So, check us out here. Poke around. Get to know us. Then, contact our Elma or Amherst chiropractic practice to make an appointment so we can get to know you. Our first priority is to provide truly exceptional care and service in our office on each and every visit. This starts on day one. We realize that choosing a doctor is a big decision and that you don’t take that lightly. Day one in our office is primarily fact finding and getting to know one another. 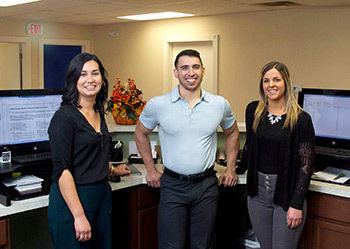 Upon entering our office on your first visit you are met with a warm greeting from one of our professional and compassionate staff members who will give you a quick tour of the office including our complimentary coffee bar and refreshment service. From there we guide you through and review your initial paperwork so that we can truly get to understand the cause of your primary complaints and conditions. The doctor will then personally review your case history and goals in order to determine if you are a good candidate for the care we offer. If you appear to be a good candidate, the doctor will perform a gentle, focused evaluation to accurately identify exactly what is causing the problems at hand. This will consist of range of motion assessment, orthopedic tests, review of neurologic function and muscle testing. Our doctors will describe exactly what is to be done beforehand so that you are as comfortable as possible throughout the examination. The doctors will then carefully review the consultation and all of the clinical findings to formulate a comprehensive treatment plan that will help you achieve quick and lasting results. If they feel that you need additional diagnostic testing or a different form of treatment, they will make the most appropriate referral for you at that time. If you have any questions or aren’t clear about any aspect of your condition, you will have the opportunity to discuss them with the doctor. On your follow up visit the doctors will sit down with you and review the findings of your exam and evaluation thoroughly in a way that makes sense. They will provide options on how to most effectively address your condition and how long you can expect it to take. The doctors can answer your specific questions so that you truly understand your condition, as well as how to regain and take charge of your health. At the conclusion of your day two consultation, you will have the opportunity to decide exactly how you want to approach your treatment. The typical visit in our office is all about you! Our staff is friendly and truly concerned about your comfort and well being. We offer complimentary refreshments, pleasant music and a welcoming atmosphere to create a unique and relaxing experience. We respect your time so we have created a system where the average wait time in our office is less that 15 minutes. The treatments are tailored to the individual, not repetitive and cookie cutter. We offer a child friendly environment also, kids are welcome to hang out while mom and dad (or grandparents!) get adjusted. In fact we offer special programs to help kids stay healthy too. 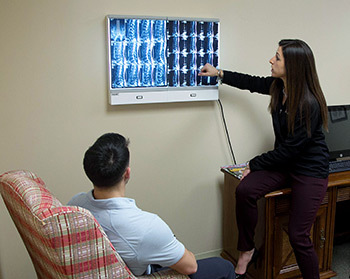 After completing a gentle and specific adjustment, the doctors will provide you with specific instructions on what you can do at home to help your condition progress even faster. Follow up recommendations will be provided and you will be on your way! Friendly, efficient and accommodating – every time. Please contact our Elma or Amherst office to make an appointment today!